Confession: I can’t find a better way to cook salmon. I’ve tried, but this is truly the best. Slowly roasting an already fatty fish in even more luxurious fat (here, olive oil) makes it nearly impossible to overcook; plus, you can flavor that oil with whatever you fancy: spices, herbs, citrus, chiles, which will flavor the fish, which is why you’re here. The first time I made a version of this dish was for Bon Appétit magazine a few years back, and people still tell me it’s their most favorite salmon in the land. This salmon isn’t meant to one-up that salmon (which also had slices of fennel and fresh chiles), but to introduce it to those who haven’t yet met its magic. It’s also to remind those who maybe have had that dish that this very simple method is by far the most delicious, easy, and customizable way to cook any large piece of fish (it’s hard to beat a perfect fillet of wild salmon, but other fish like cod or halibut also work), so feel free to explore your options. Oh, and if you’re wondering, why yes, this is the ideal dinner party trick, sitting perfectly in the center of the Venn diagram where “looks impressive” and “not a ton of work” overlap. You can even double the size of the fillet to feed a real crowd, where you will be praised endlessly by at least ten people for how silky and rich your now famous salmon is. Should you have any salmon left over, store it in the remaining oil, which will help keep it from drying out. It makes for ideal salmon niçoise, rice bowl, bagel topping, and more, so even though I say this serves four to six, feel free to make it just for one. NOTE: As I mentioned, other ingredients can be added to the baking dish to cook alongside. Try thinly sliced fennel or chiles or sprigs of herbs like rosemary and thyme. 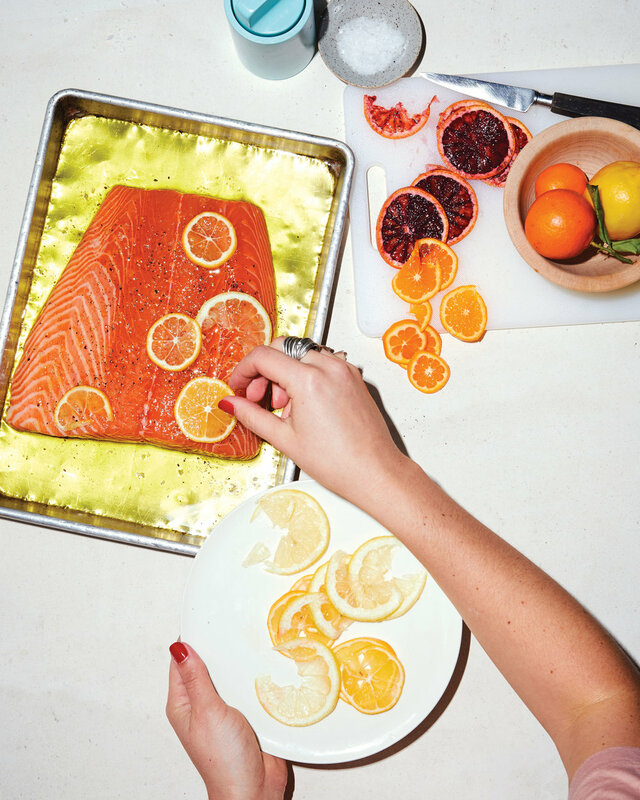 Season the salmon with kosher salt and pepper on both sides and place it in a large baking dish (a rimmed baking sheet will also work in a pinch, although the salmon will not quite be submerged) with the sliced lemons, oranges, and herb sprigs, if using. Drizzle the olive oil over everything and place the baking dish in the oven. Cook the salmon until it is just turning opaque around the edges and is nearly cooked through, 20 to 25 minutes. Toss the herbs with the lemon juice and flaky sea salt, and serve with your perfect salmon. Reprinted from Dining In: Highly Cookable Recipes. Copyright © 2017 by Alison Roman. Photographs copyright © 2017 by Michael Graydon and Nikole Herriott. Published by Clarkson Potter/Publishers, an imprint of Penguin Random House LLC.